Id even go so far as to say at one point in my life food was my best friend. I love meeting new people over a plate of food and Travelling to a new country only to be overwhelmed with the choice of what I should eat first. But, all this eating means that I am constantly facing an uphill battle trying to eat as healthy as I can without compromising on flavour. Because, let’s face it there’s no fun in having a paratha without ghee, or even a salad without dressing! The two are meant to be with each other and any diet that tells you otherwise will likely not last long – at least for me. While I’d likely not give up the ghee on my paratha or the eggs on my Kheema, I am always happy to scrap away the oil that I need to add to enable the cooking process. I’ve tried non stick pans but have found that they still need oil for sautéing onions and I’ve tried baking my fish instead of frying it only to be disappointed with the lack of crispy skin. 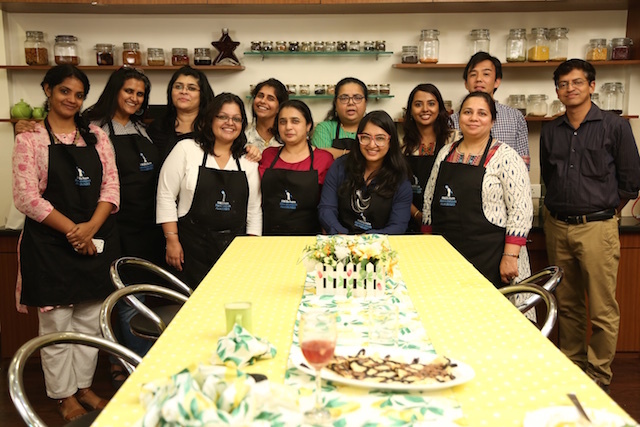 Which is why, I was pretty kicked to be introduced to the Asahi Kasei Frying Pan Foil at a recent potluck of fellow food lovers at Rushina’s APB Cooking Studio. The premise of the product is simple. Use the foil at the bottom of your pan and there’s no need for any more oil to cook your food. I thought to myself, “Sure, this could work for a stir fry type dish but making a per eedu dish without oil simply wouldn’t work!” That’s because cooking the eggs on top of Kheema, vegetables or a tomato base takes time and the lack of oil would mean a burnt base or one that stuck to the pan at the very least. I was urged to give it a go and the result was amazing! By using the Asahi Kasei Frying Pan Foil at the bottom of the pan, I was able to cook my Kheema per Eedu without a single drop of oil. Not only was the Kheema still moist but my slice of Kheema per Eedu simply slid off the plate. The best part? I could for once savour eating the yellow of the egg too without worrying about the excess calories. Below is the recipe for my Kheema per Eedu. You can ofcourse make this without the foil too but in that case remember to add about 2-3 tbsp’s of oil at the bottom first. 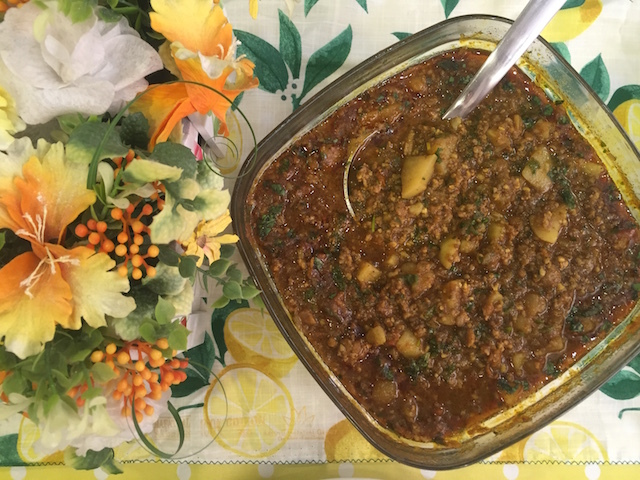 Before you begin, cook the Kheema as per this recipe that I’ve blogged about before. 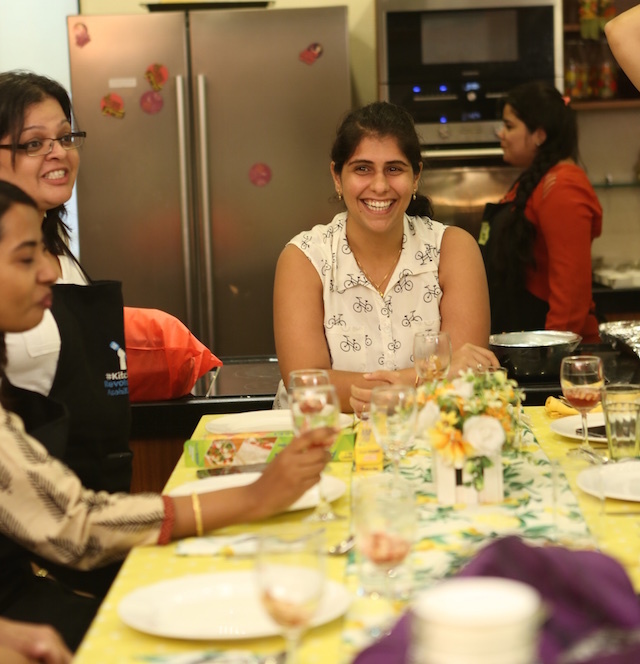 If you like, you can make it slightly sweet and sour by adding a 1″ knob of Jaggery and 2 tbsp of Kolah’s cane vinegar. Now, layer an individual sized or a medium pan with some Asahi Kasei Frying Pan Foil. Add in the cooked Kheema and then turn on the flame. 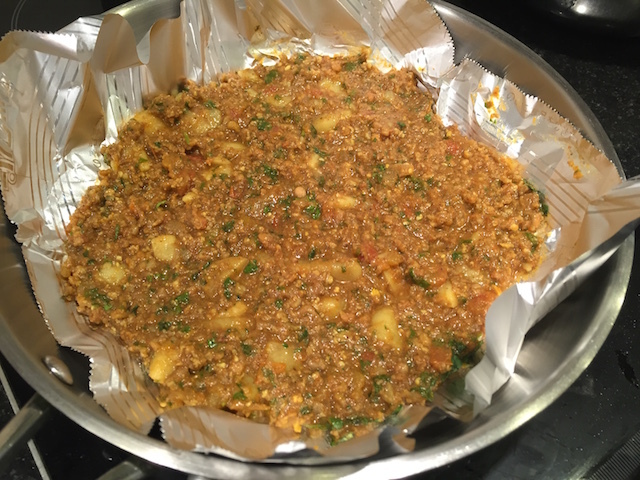 Allow the kheema to bubble at the edges and then create an even thick layer at the bottom. Make small depressions around the pan to expose the foil and crack a whole egg into the depression carefully. You could also just whisk all the eggs and add them as a topping but I feel the whole eggs add more drama. Cover the pan with a glass lid and allow the eggs to cook until just done – about 6-7 minutes. 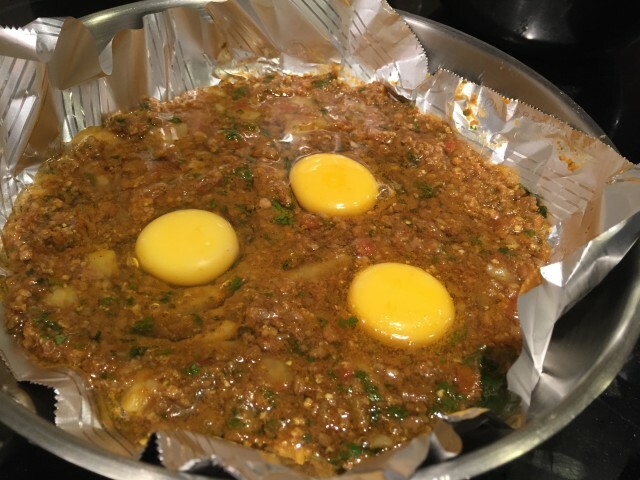 You want the yolk to be just set so that it breaks apart with your fork and runs across the kheema. 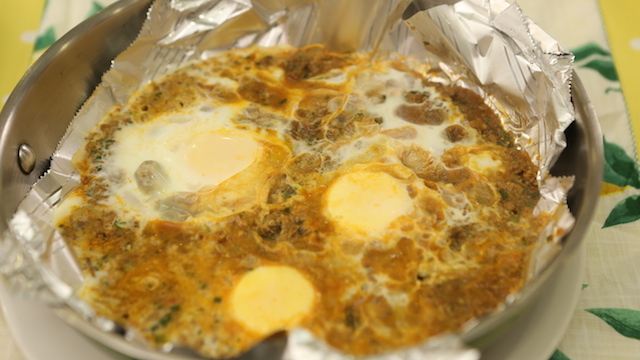 When the eggs are cooked, top with some chopped coriander and cut into pizza slices. If you’re making this for 2, I highly recommend making it in a smaller pan and serving it directly from the skillet. serve hot along with Pav or Roti. Disclaimer: This post was made possible thanks to Asahi Kasei and APB Cook Studio. Asahi Kasei products range between the ₹200-250 range and are available at Godrej Nature’s Basket stores nationwide. 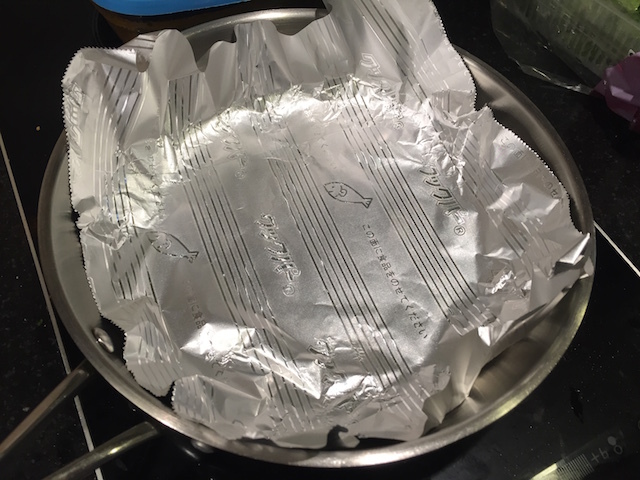 Do also try out their Cling Wrap (which doesn’t stick to everything and to itself ) as well as their baking paper on which nothing sticks whatsoever cutting down the need to grease your baking trays!